Our temporary foil backed marking tapes are ideal for construction or roadwork where temporary re-routing of traffic flow is required. These tapes are easily installed by hand with no special tools or equipment. In some circumstances, a primer sealer is also recommended. 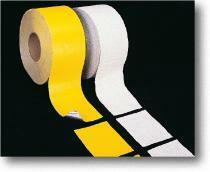 They are available in 4” widths in reflective yellow or white. 4" X 50 yds.